Their voices fade into the conversational buzz, or maybe I just stop listening because my entrée has arrived, and it’s lovely — a tender, flaky chunk of pan-seared, semolina-crusted halibut sitting on just enough potato puree to lend its delicate flavor a luxurious, earthy depth. My serving was cut from a 60-pound fish filleted just this morning by a fourth-generation island fisherman. Feingold first came to the island in the late ’80s when he was working for a conservation organization assisting the then-new Vinalhaven Land Trust. He met and married a summer kid, Nancy Seligson, and they forged their own seasonal relationship with the fishing community, located in Penobscot Bay about 15 miles from Rockland. “I became more and more infatuated with its beauty, people, and pace of life,” he says. 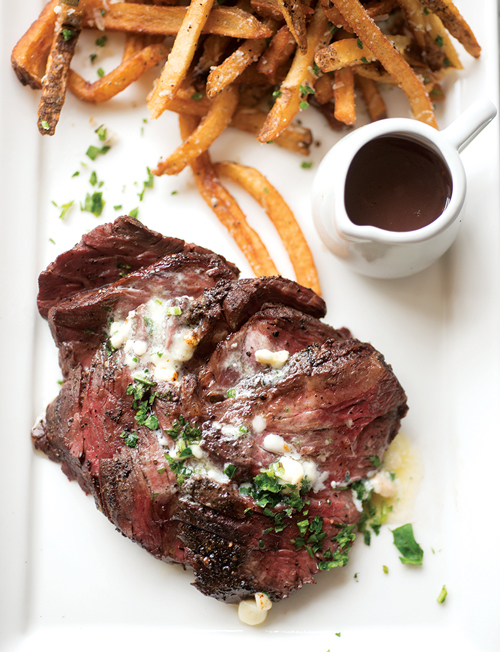 Steak-frites, a nod to Feingold’s cooking stint in Paris. Meantime, he attended the Institute of Culinary Education, where he trained at two acclaimed Manhattan restaurants, Daniel Humm’s contemporary American NoMad and French chef Daniel Boulud’s Daniel. Later, he worked alongside yet another Daniel — Daniel Rose, at his Parisian bistro, Spring. 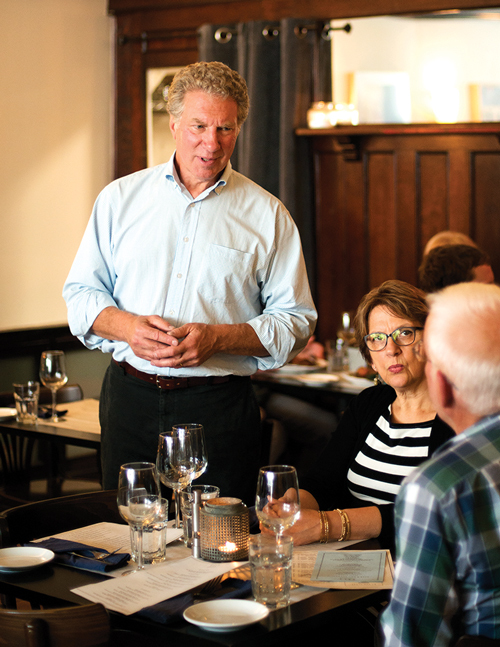 Four summers ago, Feingold opened Salt in an 1880s storefront, a former pharmacy with some original fixtures, like a wall of apothecary drawers, still intact. One of a handful of restaurants in the small village, it’s just steps from Carvers Harbor and the Vinalhaven Fisherman’s Co-op, the source of the sweet lobster knuckles in my bisque. My bisque is a soul-warming blend of fragrant lobster stock, cream, and coconut milk, with a hint of heat from red curry. Lobster also appears on this evening’s menu as an entrée, and I was sorely tempted: Lobster Four Ways includes butter-poached tail, lobster oil, lobster mousse, and Feingold’s take on Chinese soup dumplings — succulent ravioli that seep bisque onto the plate, providing a mopping sauce for the tail. 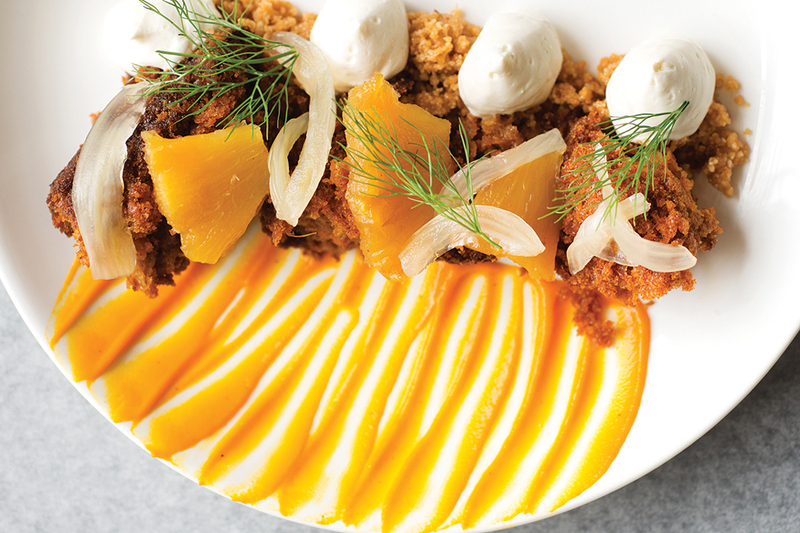 Deconstructed carrot cake with roasted pineapple, cream-cheese ice cream, and walnut brittle. 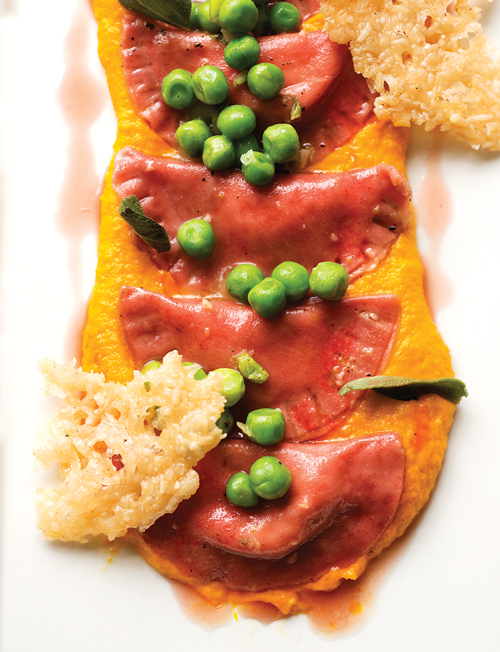 Lobster and ricotta-stuffed beet ravioli on carrot puree. 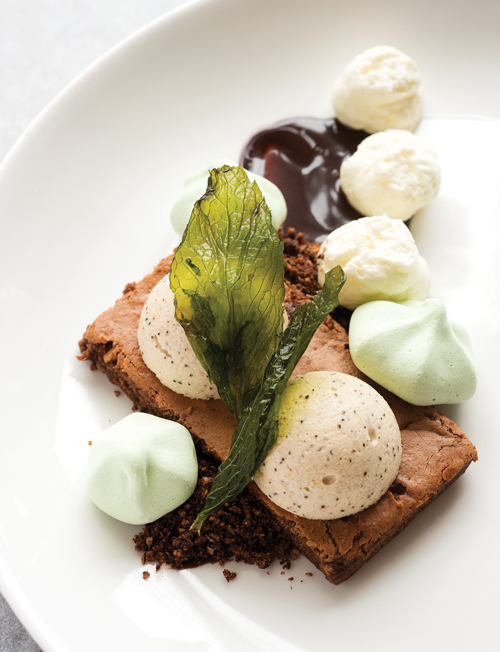 Flourless chocolate mohito cake with meringue cookies and mint. 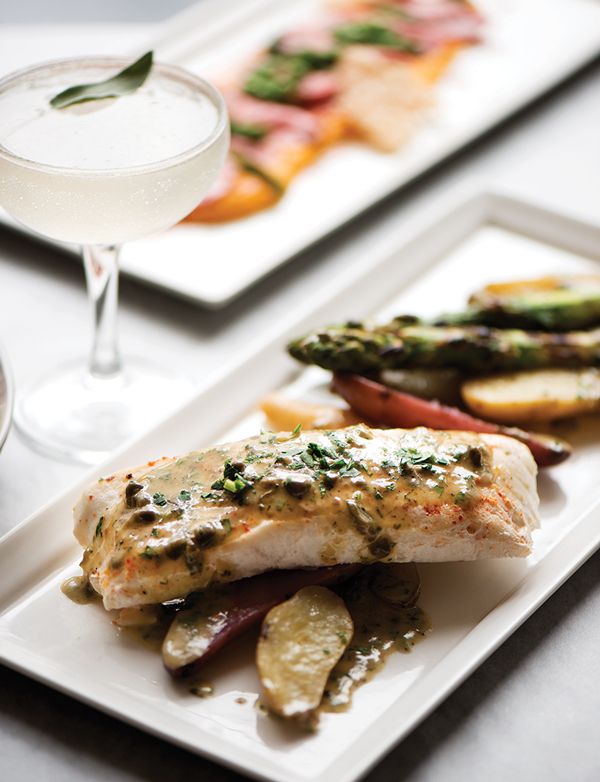 Oven-poached halibut with beurre blanc and capers, asparagus, and fingerlings. 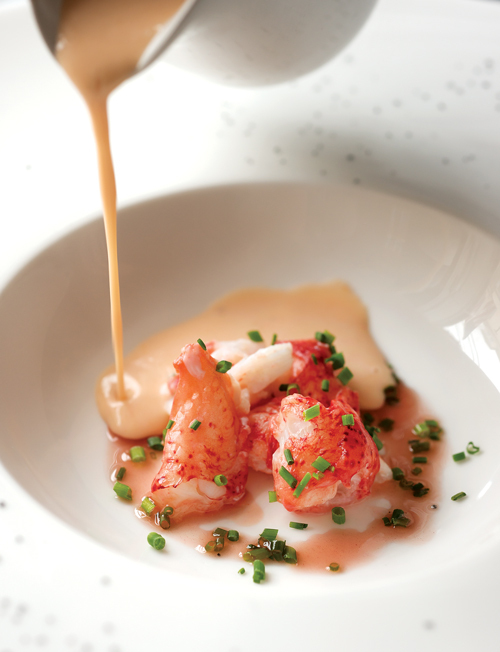 Servers pour the lobster bisque tableside, its blush hinting of lobster oil and red curry. But I’m more than happy with my halibut. Penobscot Bay’s halibut season is fleeting, and Feingold’s simple preparation emphasizes the freshness of the fish. Served with the potato puree and roasted cauliflower, it’s an elegant all-white dish but for a few green sprigs of braised leeks and a sprinkling of minced lavender flowers and chives. My pals at the bar (I readily cop to nosiness) are enjoying Salt’s only mainstay entrées — a juicy, fat burger and grilled hanger steak served with Roquefort butter, smoked-bacon aioli, and herbed Parmesan fries. Both the steak-frites and burger have been on the menu since day one; Feingold says any attempt to tweak them sparks protests. Visual presentation is impressive here, and pastry chef Danielle Henry has an especially creative touch. My orange-matcha tart resembles an artful arrangement of treasures from the sea: smooth, thick orange curd is topped with pink and orange roe-like orbs that burst with citrusy flavor and bits of green-tea cake that resemble sponges. It comes with a small scoop of matcha ice cream resting on coarsely chopped pistachios. It’s a beautiful combination of color and texture. It’s delicious too. 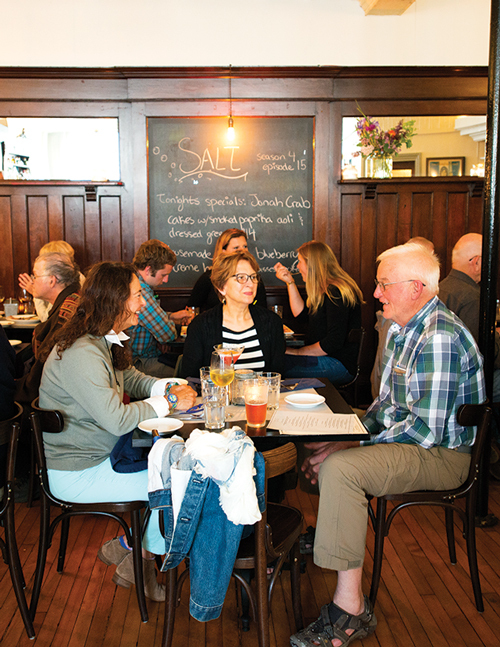 Feingold is passionate about Vinalhaven, even the challenges it presents. He draws on island ingredients as much as possible, not only because they’re fresh and good, but because it makes financial sense — shipping from the mainland is expensive. 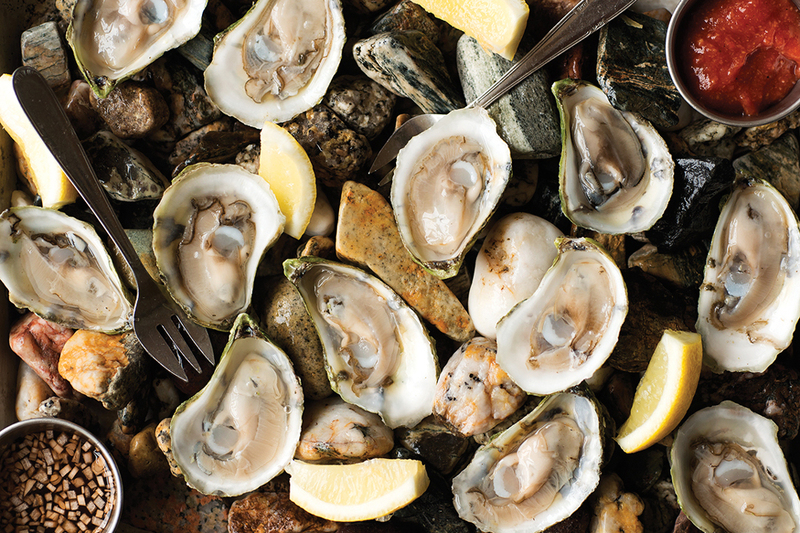 For oysters and local beer, he drives to the other end of the island and waits for North Haven Oyster Company’s Adam Campbell and North Haven Brewing Co.’s Ben Lovell to come across the Fox Islands Thoroughfare. It’s difficult to decide what part of this article is most insulting–the portrayal of the “burly islander” who is the token local at the fancy restaurant, there for everyone’s amusement, or the implication that the food at any other establishment on Vinalhaven cannot possibly compare to SALT (insert eye roll). “Instead, he aims to offer “good food done in unfamiliar ways — a higher level of cuisine than what’s currently being offered here, but approachable.” This is beyond insulting. Just because other VH restaurants refuse to pay for stuffy reviews of their restaurants does not make them sub-par. Food that is “lovely and local”? They are certainly not pioneers in that feat. What this establishment brings to the town of VH does not overshadow the VERY NEGATIVE contributions some of their staff have made to an otherwise lovely and safe town. 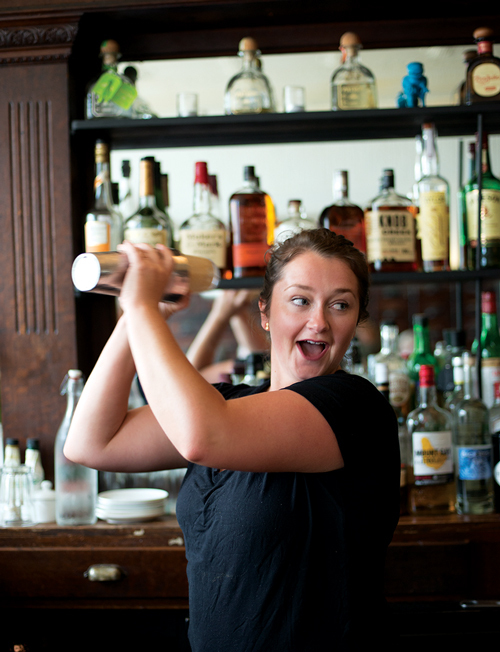 Be sure not to “party” with the staff after hours–who knows what will end up in your drink!!! PS–SALT owes a shout-out to the other island establishments who saved them from a horrendous opening night–no CO2 or propane and who do they call to bail them out? Show some respect!!! Shout out to the Haven for saving us Friday right before service and shout out to Vinalhaven Fuel coming in Friday evening. Let’s all continue to work together and support eachother. Cheers! What a sad inferiority complex you have, Law Abiding Islander! This review doesn’t insult us. It doesn’t state that the man telling the story is “the token local” there for “everyone’s amusement. 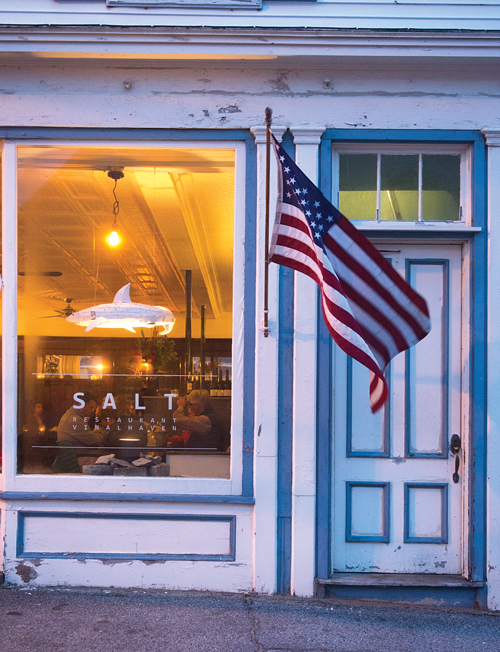 Rather, it notes that there is a mix of locals and summer people at Salt. This is true. Chef Feingold doesn’t insult other island restaurants when he speaks about a higher level of dining. For goodness sake, look up the term: he’s talking about haute cuisine. For that matter, just look at the food: Does any place else on Vinalhaven serve food like that? No, they don’t. Does acknowledging that mean those other restaurants are bad? No, it doesn’t. It just means Salt offers a different kind of dining experience. What’s wrong with that? 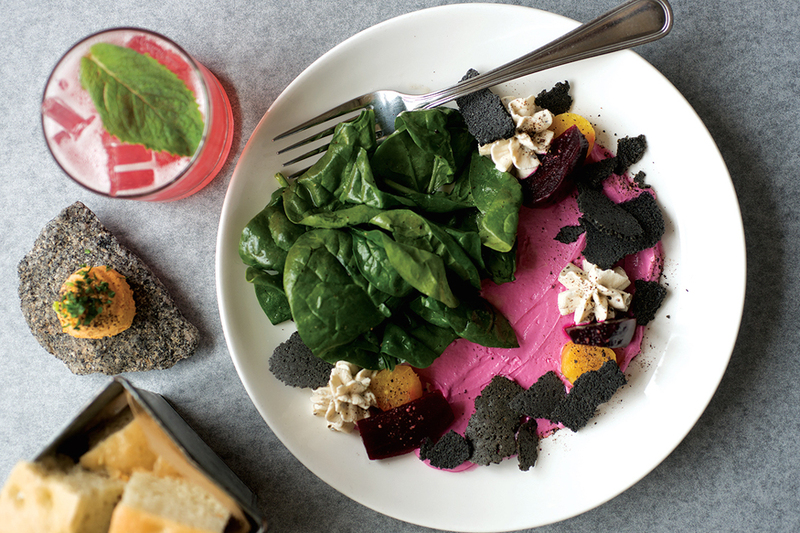 Have you even eaten at Salt? As for the staff that YOU insulted with your comment: nearly all of them are year-round residents. Nice going. You infer negativity where I see affection. Why is that? And this food writer dined at SALT then contacted us afterwards. That is exactly how these articles work. Our only marketing is The Wind, we don’t want any further marketing. We want to be able to accommodate our island regulars and walk ins. Cheers! Also, we are not a “fancy” restaraunt. And my bar is 99% islanders each night. We welcome all walks of life, and we would like to not be categorized as fancy, under any circumstances. Thank you.